How Far is Nahar Jothi Apartment? Nahar Jothi is a residential development. This is one of the Ongoing projects of Nahar Foundations Pvt. Ltd. The project has a thoughtful design and is well equipped with all the modern day amenities as well as basic facilities. 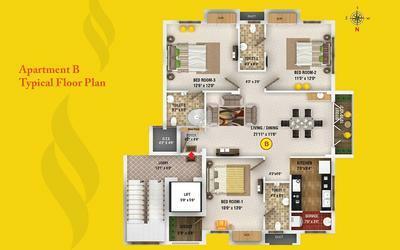 It offers 3 BHK apartments. Framed structure with RCC column beams over masonry walls of 8 inches and 4 inches walls plastered and finished with cement paint internally and externally. Ceiling height will be 9'-6" feet approximately except in the toilet where it will be 8'-6". Living, dining and bedroom area will be finished with good quality vitrified tiles of builder’s choice with necessary skirting. Ceramic flooring in the toilets will be provided as per builder's choice. Walls will be covered with ceramic tiles as per builder’s choice upto a height of 7 feet. Concealed / open plumbing lines from the overhead tank will be provided. All C.P. Fittings will be Metro/equivalent fitting. Hot and cold wall mixer will be provided for shower area. All C.P. fittings will be Metro - S / equivalent fitting. Toilet closets will be EWC floor or IWC as desired. Main doorframe will be of teak and door shutter will be of good quality teak finish skin, and finished with lacquer varnish. Other doors will be with good quality wood frames and flush doors painted on both sides. All door fittings will be of aluminum excepting the front main door, which will have brass fittings. Main door will be provided with Godrej or equivalent lock, door eye, tower bolt & door stopper. Doors to the bedrooms will be provided with cylindrical locks. Ventilators will be of good quality wood frame fitted with glass louvers. Kitchen platform will be polished granite with a single bowl stainless steel sink and glazed tiles dado of 2’0” feet above the kitchen platform, 3’0” feet dado in utility area (if provided). One in kitchen and in all bedrooms will be provided. Switches & sockets with adequate points for light, fan and power supply will be provided. Three phases supply with manual phase changer will be provided for each flat. One individual letterbox will be provided at the entrance to the building. Concealed PVC pipes for TV antenna will be provided in the living room and bedrooms. A common board will be provided near the entrance to the building for incoming telephone line, with provision for concealed wiring from this board to points in each flat in the living room and the bedrooms. "Homing in on the best"
Nahar Foundation’s Private Limited (NFPL) saw its beginning that reflected their penchant to provide quality realty solutions, and that aimed at creating homes and not just houses for their clients. Their keen eye for detail and expertise with the intricacies of construction has brought over 60 prestigious residential projects to the firm’s dossier. The Nahar Ailis offers Ready to occupy 4BHK Villas in Neelankarai, ECR, Chennai. The Nahar Jaishree one of the prestigious landmarks of the builder built on a CMDA Approved layout with units of 2,3 BHK Apartments in Pallikaranai developed in a CMDA Approved layout. Some projects are built just to satisfy a class of customers, Nahar Jothi Apartment is one such project which is currently Under Construction with units of 3BHK Apartments in Porur one of the busiest hubs. Incorporated in the year 2003, Nahar Foundations has offered exceptional real estate developments over the years that adorn the city’s magnificent skyline. 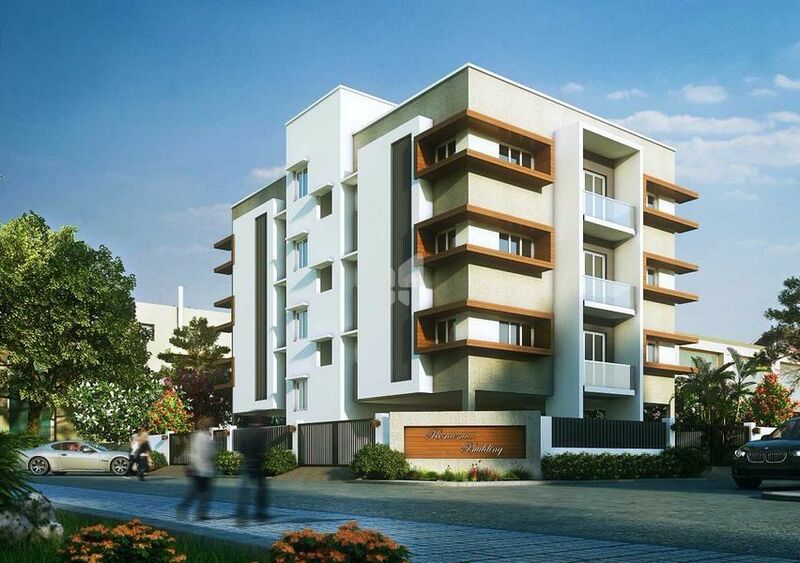 Nahar Poornam is a Prelaunch by the builder built with luxurious 2,3BHK Apartments in Ponmar, Chennai. Being active in Chennai and its suburbs, the builder has been developing projects with a far insight on the locality. The projects are developed in major residential hubs of Chennai, and the builder has been choosing areas where the potential investments are higher. The projects of the builder have been creating good vibes among the users as they are built to satisfy the exceeding expectations of the customers. Built on trust to enlarge more, the builder has been creating many happy home buyers till today. We at Nahar Foundation are driven by only one vision – total customer satisfaction. We aim at achieving the perfect synergy between form and function so that your home is your pride and joy. Having established an enviable reputation in the field, our mission for the coming years is to be diversified into newer geographies and new lines of business verticals, while adding to our achievement in our existing business of turn-key housing construction.